Israeli winter becomes official when Hanukkah begins, the Jewish Festival of Lights. Beginning this year on Tuesday December 12th, The Norman boutique hotel in Tel Aviv warmly welcomeS guests for Hanukkah and Christmas vacations with a festive winter guide. When Hanukkah arrives in Tel Aviv the city focus shifts to street parties, sufganiyot ( delicious donuts with a variety of sweet fillings), holiday markets and a number of events. Hanukkiot (candleabras) are lit all across the city, with one more candle lit for each day of the 8 day holiday, often accompanied with a mini-local event. When the holiday is over, winter sweet treats can still be found in many local bakeries. Roladin: the biggest name in donuts gets more creative every year. Some of the flavours of the moment: Tiramisu; coffee & white chocolate; Black Forest with whipped cream; Belgian chocolate & a cherry chaser; Bianco chocolate with Italian milk chocolate ganache; sugar pearls and chocolate hazelnut chaser. Kurtosh: Their sweet-treat specialty is a Hungarian yeast dough covered in sugar, however their sufganiyot, varying from the traditional to the more extreme varieties include margarita and macchiato flavors – not to be missed. The Tel Aviv marathon has become one of the biggest international sports events in Israel, much enjoyed by sport lovers and dreaded by those who don’t want the city traffic halted. Last year a record of 100,000 tourists and locals watched the 40,000 runners from Israel and around the world. 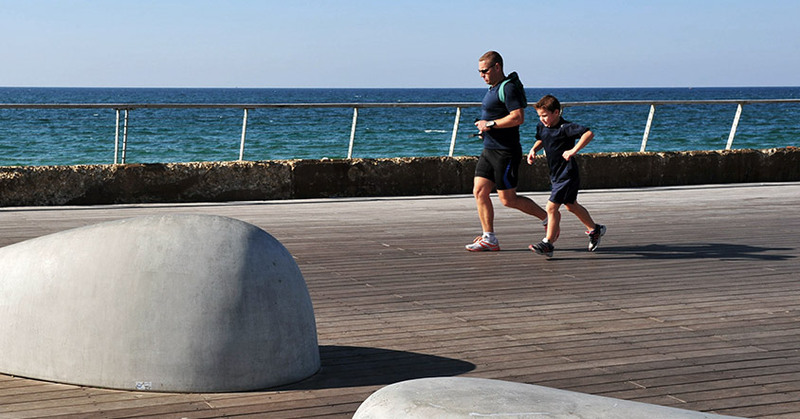 Mild Tel Aviv winters make it possible to lounge on the sand or do water sports. The sea’s temperature generally doesn’t drop below 17C (62.6F), so suitably outfitted in a wetsuit, you can surf to your heart’s content. And if a storm brews up, join all the Israelis who flock to the shore to watch the fun and drama unfold.